Trinity Central launches new LifeGroup in Olympic Village At the start of the next LifeGroup term, Trinity Central will have a new LifeGroup starting up in Olympic Village, led by Mark and Sarah Peskett. 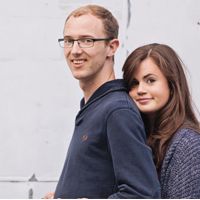 We had a chat with Mark and Sarah, to find out more about them and their plans for LifeGroup. Q…. We’re excited to be starting a week of prayer together as a church – during these weeks God speaks to us as a church family and often surprises us. When Jesus taught His disciples to pray He encouraged them to start by saying: “Our Father…” All too often the enormity of this passes us by…. I need to give to God? Why?